Come Shop With Us In Store! WE HAVE RECENTLY MOVED. we are now located in the Highland Pavilion Shopping center beside the Ark Animal Hospital. If your question is "Where can I buy scrubs?" or "Where can I buy uniforms?". 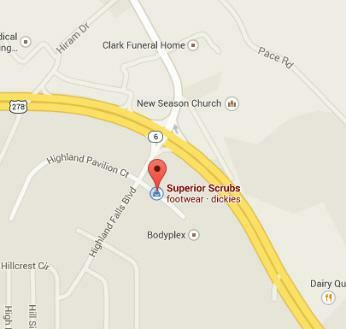 Our uniform store Superior Scrubs in Hiram has everything you would ever want from a scrub store or uniform store. We have the latest brands and styles of medical scrubs, hospital uniforms, and nursing scrubs, for the fashion savvy medical professional. It’s the last scrub shop or uniform store you’ll ever need to visit! Find all your nursing uniforms, medical equipment, stethoscopes, nursing shoes, badge reels and medical uniforms at this scrub store. If you are in Hiram, Smyrna, Mableton, Atlanta, West Atlanta, North Atlanta, Sandy Springs, Douglasville, Marietta, Powder Springs, Vinings, Fair Oaks, Alpharetta, Roswell, Kennesaw, Cartersville, Lithia Springs, Austell, Norcross, Acworth, Kennesaw, Newnan, Canton, Dallas, Rockmart, Peachtree City, or Rome you will never have to search for scrub shops or medical uniform stores again!